Sorry. Did I mention pork belly? I'm surprised by the number of people that still pull a face and complain about pork belly being fatty and greasy. This slow-roasted pork belly slab is indeed a bit fattier than other cuts, but then it's belly for goodness' sake. It has the sweetness of the cider (it's all cooked, so it's ok if you are avoiding alcohol), soft, melty onions and then a whole garlic bulb that turns like paste after the long roasting in the oven. You just squeeze it out of the papery skins and eat it with the pork and the cidery juices in the pan. Honestly. You want to put this on late morning on a Sunday and tuck in once it's all cooked, later in the afternoon. It's one of our super favourite roast dinners now. 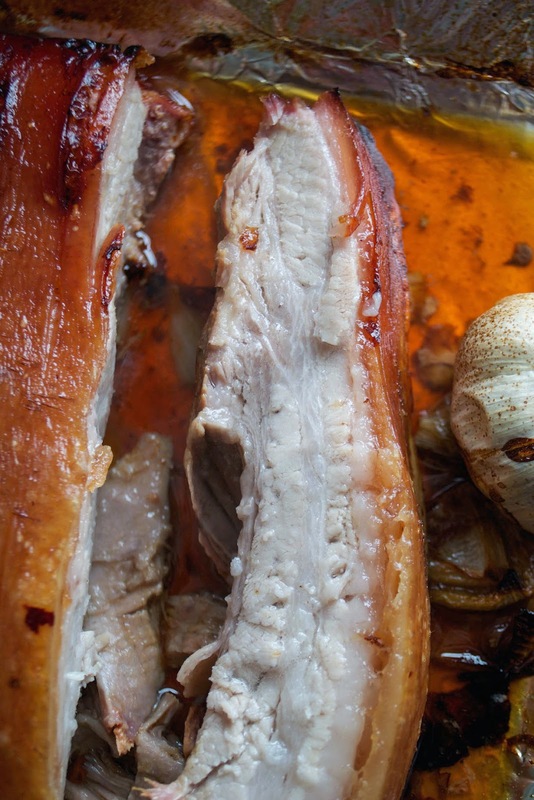 The timings for the recipe are based on Jamie Oliver's pork belly roast. A note on the cider: Do you know, some people say that cider isn't 'paleo' and that cavemen wouldn't have known how to make it. Firstly, a) the paleo diet isn't really just based on what cavemen ate - and b) I think that they did drink cider - because it's just fermented apples, which is something that happens in nature. I like to think of them, getting a bit giggly and rosy-cheeked, painting on cave walls as the sun comes up, having accidentally drunk the juice of some gone off apples. So there you go. Turn your oven up as high as it will go, and get out a shallow roasting tray. I like to line mine with foil to save on the washing up afterwards, as everything will go very dark and sticky. 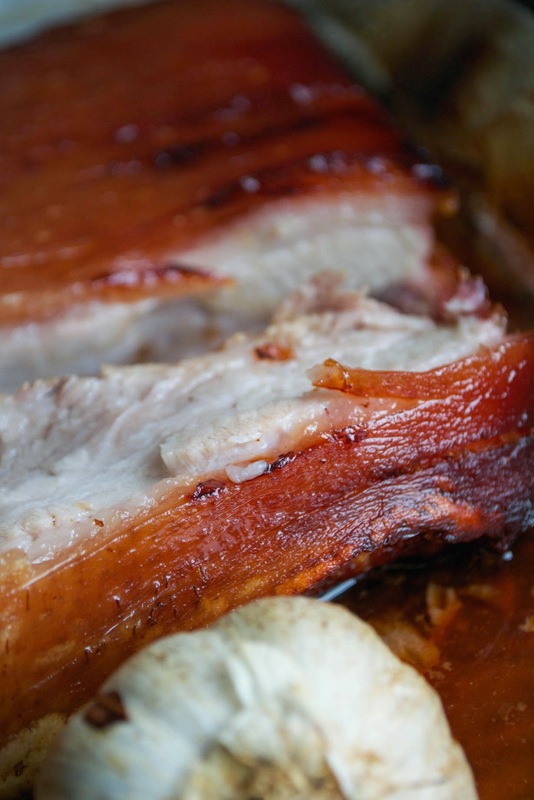 Pat the skin of the pork belly slab with a kitchen paper towel, so it's dry and sprinkle over a pinch of salt. On the roasting tray, arrange the onion slices and put the garlic bulbs near the centre of the onions. Lay the pork joint over the top, skin side facing up. Slide into the oven and roast for 10 minutes - you'll see the skin start to bubble and crisp up. Once the 10 minutes are up, turn the oven down to gas mark 3/170ºC/325ºF and roast for another hour and a half. The pork should now be fairly cooked, but you'll want it a bit more melty. Pour the cider into the tray, around the pork - don't pour it straight onto the skin, but around the base of the roasting joint, and then slide back into the oven for another 45 minutes. This will give you plenty of time to get on with your vegetables. 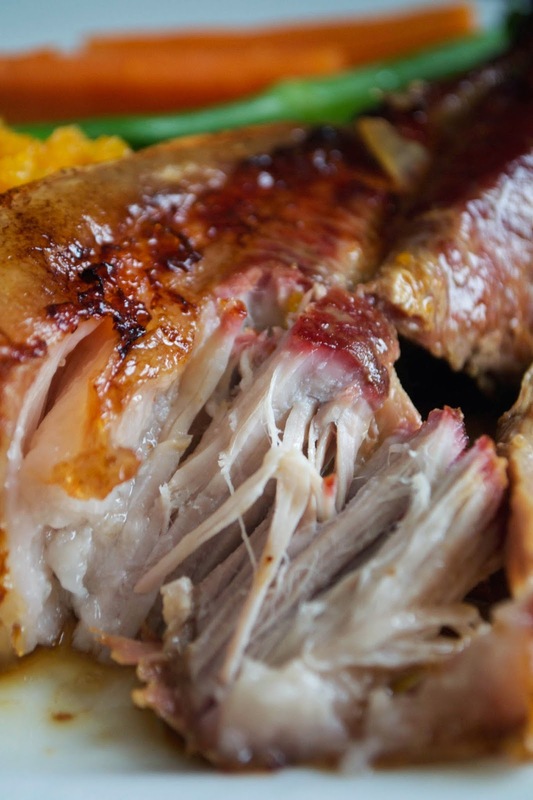 Once the 45 minutes are up, bring the pork joint out of the oven and allow to rest for 15 minutes. Then, cut into slices with a sharp knife and serve with the garlic and the roasting juices spooned over the top. Beautiful.